W. Kamau Bell, Ashkon and Throwing Shade's Bryan Safi and Erin Gibson join Jesse and Jordan for a live show at MaxFunCon. I am, frankly, too far from San Francisco politics these days to endorse a candidate for mayor. Even if I was going to endorse a candidate, I wouldn't do it here. In light of Soulja Boy's spectacularly ill-considered lyric about the troops, I thought I'd share an old favorite. It's a remix of Crank Dat (Soulja Boy) by our friend Ashkon. Enjoy! 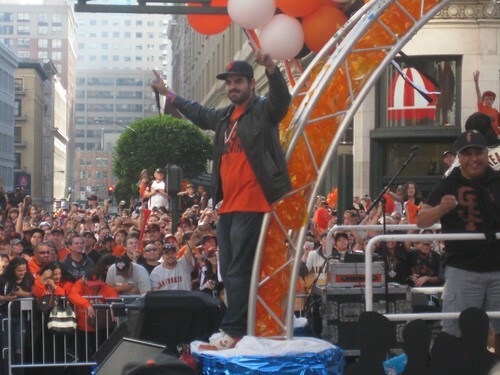 Our pal Ashkon celebrates the Giants' victory at the World Series parade in San Francisco. Big Time Gene O'Neill joins Jesse and Jordan to talk about elaborate ruses. We also talk with Ashkon about his San Francisco Giants anthem Don't Stop Believin'. Two things I can get behind. The San Francisco Giants and our man Ashkon. I'm a big fan of giving a shout-out to F.P. Santangelo, as well.